With the festive season upon us, the problem of loneliness is brought to the forefront of our minds. How by using the right technology, daily contact can help organisations reduce loneliness for individuals at risk of social isolation. ‘Let’s Make Christmas Happier’ sadly demonstrates. Loneliness is an issue which can affect anyone of any age at any time and is seen by many experts as a growing epidemic in today’s society with many health consequences. 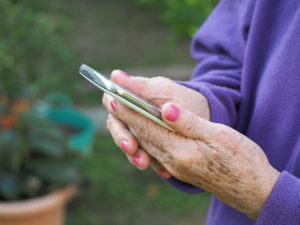 While technology can be seen as an ‘easy cure’ to better connect us, it can also play a significant role in actually increasing loneliness. 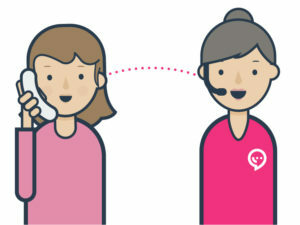 In a world where technological innovations often overlook the need for real contact, all of Alertacall’s services are underpinned by bringing together ingenious technology with a passionate, highly trained team to give individuals daily access to a friendly voice. Here we look at how daily contact can help social care and other organisations, who provide services to those who may become socially isolated in order to reduce loneliness. The Campaign to End Loneliness has found that for half of people aged over 65 in the UK, the television is their main form of company. Nearly a fifth of this age group see their friends, family and neighbours less than once a week. Of course loneliness is not limited to any particular age group or demographic; “young or old, loneliness does not discriminate”. Loneliness can have an extremely negative effect on both our mental and physical wellbeing, with a whole host of associated health problems. Encouragingly, steps are now being taken to combat the problem. The government has appointed a minister for loneliness for the first time – Tracey Crouch MP. The Commission on Loneliness, founded by MP Jo Cox, is working with organisations and charities across the country to formulate solutions. And on 15th October 2018 the Prime Minister Theresa May launched the first cross-Government strategy to tackle loneliness which set out a series of commitments to help all age groups build connections. Social prescribing is a big part of the Government’s Commission on Loneliness and is seen as a major solution to the loneliness problem. Theresa May recently announced that “social prescriptions would reduce demand on the NHS and improve patients’ quality of life”, and there are plans for a new approach to social prescribing be in place by 2023. In a technological age in which mobile devices and social media enables us to connect with others at distance, there is an ironic consequence of such technology. Far from alleviating loneliness and social isolation, it is increasing it. From internet shopping to ‘screen addiction’, it is easy to see how some technologies can reduce real human interaction and perhaps sometimes contribute to loneliness in society across all age groups. Even certain ‘telecare’ technologies, such as pendant alarms, are reactive services that work on the principle of encouraging customers to only make contact in the event of an emergency. Many assistive technology innovations are designed to enable health and wellbeing to be monitored remotely by the equipment, rather than by people, thus removing human contact. Proactive daily contact services, like those pioneered by Alertacall, encourage real human contact and have many benefits for customers in the fight against loneliness. Alertacall works on the principle of proactively establishing daily contact 365 days a year. Daily contact from Alertacall is controlled by individual customers using specially designed devices installed at their property. Each device has an OKEachDay button which customers use to pick up messages – no button press results in a friendly call from one of our specially trained team members. The service allows the individuals to get on with their day without being tied to wearing any kind of device or having to ‘wait in’ for a call or visitor. Crucially, customers have complete control and choice, and, if they choose not to press, know that our friendly team will be in touch and that they will always have a real person to talk to. It is important that in providing services for those with higher needs we still value an individual’s independence. However, it is equally important that while people remain independent they do not feel ‘alone’. For Alertacall, the technology is never a replacement for real human contact but is, in fact, a conduit to it. With human judgement we can identify potential problems that technology cannot, such as increasing social isolation, deteriorating health conditions or increased assistive technology needs. With contact times tailored to suit the individual, a daily contact service is personalised and unintrusive. Many organisations, such as those in social care and health, are in a unique position to reduce loneliness amongst those in their care. For one thing, frontline staff are able to provide real human contact to people, and even get to know them on a personal level. With issues of funding cuts and overstretched resources, it is not always easy for social care and health professionals to give as much time to people as they would like. The WellBeing Proactive service helps organisations provide daily wellbeing checks 365 days a year, as well as offer a range of supportive services over the telephone (for example, appointment and medication reminders). In various ways, the service can improve and in fact increase human contact that customers receive, whilst helping staff to free up their time and give one-to-one support to those who need it the most. The devices provided by Alertacall also deliver social prescribing messages. Social prescribing, sometimes referred to as community referral, is a means of enabling social services or health professionals to provide prompts for events and activities in their area, and even suggest exercises or dietary advice. Loneliness has been long recognised as a growing public health crisis. 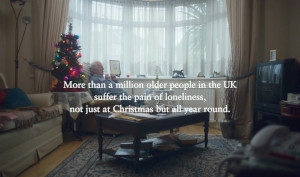 With the festive season upon us, the problem of loneliness is once again brought to the forefront of our minds. In a recent survey, 98% of users said they would recommend Alertacall services – primarily as there is always someone to speak to 365 days a year. Recent governmental developments are certainly making positive steps to tackle the issue. However, we all have a responsibility to look out for one another. Daily contact services can really help individuals and organisations in many positive ways, from improving overall levels of communication, to reducing social isolation and assisting in social prescribing to helping staff to better manage their time and resources. Here at Alertacall we work with many organisations across the UK with a range of daily contact services. For more information on how our services can help you, call Alertacall on 0808 208 1234 or email contact@altertacall.com.